This collection makes available vocal scores for 41 choral works by three masters from the 18th and early 19th centuries. This collection makes available vocal scores for G.F. Handel's familiar and lesser-known choral works. This collection brings together vocal scores for 38 secular and sacred choral works by three masters spanning the 19th century. This collection makes available piano/vocal scores for Johann Sebastian Bach's 199 Church Cantatas -- indexed by title, voice type, and BWV number. This collection makes available vocal scores (mostly modern clef editions) for J.S. Bach's larger choral works. 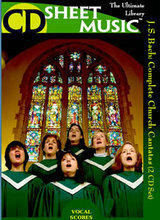 Includes: St. Matthew Passion (English & German), St. John Passion, Mass in B Minor, Magnificat in D, Christmas & Easter Oratorios, Motets, other masses, secular cantatas, and more.